Last week, I had the privilege of attending an event at the Hourglass Flagship store in Venice Beach dedicated to the launch of the new *Vanish Foundation. This revolutionary formula features a triangle shape and natural, nearly invisible convertable coverage that spans from sheer to full in a couple of passes. Simply beautiful! I also received my last outfit pick (mentioned HERE) from the Nordstrom Anniversary Sale and am thrilled by how well it embodies my personal sense of style...Frame Denim + an Equipment France blouse = my uniform. Initially discussed HERE, the *Hourglasss Vanish Foundation comes in a commendable 26 shades and is also currently available at Blue Mercury and Hourglass; it will also be in stock at Sephora and Barney's NY soon. The coverage is buildable from sheer, all the way to full with a minimum of product. I find the finish to be extremely natural; it is neither ultra matte nor extra dewy...the satin matte finish just gets better as the day wears on! The unscented formula is smooth and hydrating; it blends easily without feeling heavy and, I suspect, it will work on a variety of skin types from dry to oily. My skin is very sensitive and I haven't experienced any irritations or breakouts after consecutive days of use. Even though it can indeed offer the coverage of a concealer, I prefer to use additional concealer in my under eye region because I like a slightly lighter shade in that area. However, if I were to pick up few more shades (e.g., a concealer shade for my skin tone like Buff and contouring shade like Almond), then I could use this formula exclusively. When combined atop the *Hourglass Mineral Veil Primer (I've gone through bottles of this in the past and, until recently, forgot how much I like this formula) and buffed in (I apply the foundation in small strokes directly from the bullet) with the luxuriously dense *Hourglass Vanish Seamless Foundation Brush, I get 8+ hours of flawless, touch up free wear, even in extreme heat and humidity (which were the weather conditions when the images at the end of the post were taken). True to its claims, the Vanish Foundation is waterproof but, unlike similar stalwart formulas, does not feel weighty, suffocating or dry on the skin...so good. All in all, I am extremely impressed with the *Hourglasss Vanish Foundation. The divine coverage, natural finish and tremendously long wear time make this formula a truly exciting launch in the foundation category and the existence of 26 shades guarantees that most (if not all) will find their ideal match. A revolutionary foundation stick with the coverage of a concealer, the fluidity of a liquid, and the weightlessness of a powder in a longwearing waterproof formula for undetectable full coverage. The unprecedented concentration of pigment in this foundation provides maximum coverage with minimum product, concealing all discoloration and imperfections for virtually perfect skin with a seamless finish. Swatched in mixed outdoor lighting. *MUFE HD Foundation #118 (reviewed HERE) is lighter in depth and more neutral than Vanish Sand. *Chantecaille Future Skin in Cream (reviewed HERE) is lighter and a touch less yellow than Vanish Sand. *Surratt Surreal Real Skin Foundation #9 (reviewed HERE) is a touch peachier/more olive than Vanish Sand. *Marc Jacobs Re(Marc)Able Foundation in Beige Golden (reviewed HERE) is slightly deeper and more yellow than Vanish Sand. *Gressa Minimalist Foundation #3.5 (reviewed HERE) is similar in depth and slightly more yellow than Vanish Sand. *La Prairie Skin Caviar Concealer + Foundation in Amber Beige (reviewed HERE) is peachier than Vanish Sand. *Le Metier de Beaute Afterglow Foundation #8 (reviewed HERE) is very similar in tone to Vanish Sand. Components for the complete look. *Hourglasss Vanish Foundation in Sand applied with the *Hourglass Vanish Seamless Foundation Brush. Clé de Peau Beaute Concealer in Beige (also available at CdPB and reviewed HERE) applied in the under eye region to conceal and brighten. Charlotte Tilbury Instant Beauty Palette The Dolce Vita Look (reviewed HERE)--I applied the Bronze shade with my *Surratt Beauty Artistique Sculpting Brush to the hollows of cheekbones and the perimeters of my face and used the Highlight (applied with the *Wayne Goss Air-Brush) on the high points of my face. The Swish and Pop shades were buffed into the apples of my cheeks for a softly flushed look. I used my ring finger to sweep a touch of the *Marc Jacobs Beauty Glow Stick (reviewed HERE) along my upper brow bone and down the bridge of my nose for additional luminosity. To brighten, I added the *By Terry Ombre Blackstar in Bubble Glow (reviewed HERE) along my lower lash line. It always manages to make me look more awake! *Le Metier de Beaute Hydra-Plump Lip Serum (reviewed HERE)--this volumizing lip treatment has been a non-negotiable in my routine as of late. *Charlotte Tilbury Hot Lips in Kidman's Kiss (reviewed HERE)--apricot pink perfection with a glowing matte finish, two coats make lips look full and pigmented. FRAME Denim Le High Straight High Rise Staggerd Hem Jeans: Although the blue version is now completely out of stock, I am thrilled that this style also comes in black and is still readily available. The denim is soft yet holds shape well and they are so comfortable on the waist, especially for a high rise. The cut hem adds an interesting twist that looks incredible with booties (I'm wearing them with this extremely comfortable pair of Pikolinos--on sale!). I find that FRAME runs a bit large, so a size 24 (I generally wear a size 24 or 25) fit perfectly without being inordinately binding. Equipment France Leema Shirt: Made of cotton (rather than Equipment's usual silk), with a silk leopard pocket for accent, this pinstriped blue buttondown is classic yet unique. I wear Equipment multiple times a week and know I'll get a lot of use from this style...at $131 (during the sale), this is a veritable steal. I ordered a small but could have also worn a medium as this particular blouse does not run as large other Equipment shirts I own. Bottom Line: I hope you enjoyed this overview of the *Hourglasss Vanish Foundation (also currently available at Blue Mercury and Hourglass and soon in stock at Sephora and Barney's NY) + style feature! Cutting-edge and high performance, the foundation is marvelous for a multitude of skin types and skin tones and I implore you to pick up the gems from Equipment France and Frame Denim before they sell out. Early access for the Nordstrom Anniversary Sale is still underway for card holders...what's on YOUR list? Thank for all the light and dark swatches doll! My absolute pleasure, Lily...love sharing the whole spectrum! How does this compare to Tom Ford's foundation stick? Thank you! Thank you for the very informative post. I'm so excited to try the Vanish foundation and you look beautiful as always. Thanks, Dom and hope your first week back to teaching is going well! Hi Rachel! I definitely have to check out that foundation! I purchased the Charlotte Tilbury palette and LOVE it! It is perfect for travel. The Wayne Goss airbrush was instant love the minute it touched my face. Your outfit is fabulous. Thanks for the wonderful swatch work. Love hearing that you are thrilled with the travel and yes, the WG Airbrush is so good...sad it is sold out now! Thank you for the encouraging words, my friend! I appreciate your readership and support!!! 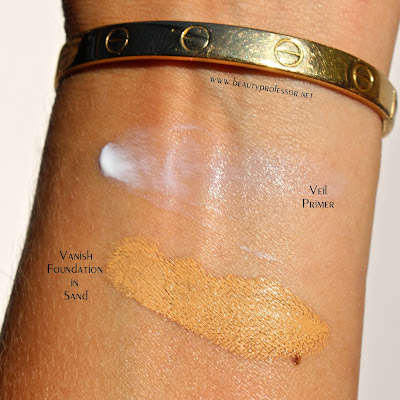 I was wondering the same about the comparison of this with the Tom Ford stick foundation! It is more hydrating and longer lasting in my experience! Thank you so much for showing all of the shades for the Hourglass foundation! I have been waiting to see a review on this and am so glad you liked it. I have my trusty MUFE and Lancome Teint Idole foundation sticks, but still may need to splurge on this one. My absolute pleasure! I am thrilled you found this review helpful! From what I can see from your swatches, bisque will fit me. Thank you. Thank you so much B.P! I definitely know what shade to order. You have the best swatches. So lovely to hear from you and thank you, my friend. You'll have to let me know how you like the formula! Hi Rachel, is there much difference between Bisque and Linen? Hello...Bisque is slightly peachier/more neutral than the pale yellow Linen! Worship you and your thorough, invaluable advice! You have steered us so well in the cosmetics world, and saved me from a detrimental purchase on more than one occasion. I am fortunate that your personal color matches in foundation ( particularly in non-summer months ) often correspond to my own, despite the fact that I do not have olive to my skin tone. Curious which shade of the Hourglass foundation you would select in months when you haven't had much sun? (Jan-March). Your input is so greatly appreciated!! I wear Beige in the non-summer months and it's perfect! A bit late to the party (!) with this one, but Wow! Thanks for the BEST swatch selection of this foundation, which I am absolutely DYING to try. You've allowed me to guess my shades and do an online order rather than have to get on a train and travel to the nearest city that stocks Hourglass in store. I am a PhD student who is writing on Representations of Female Beauty and Cosmetics Use in English and French Literature 1848-1901 so cosmetics and academics are my thing too! What a delightful comment! Thanks for the kind and encouraging words and I am thrilled that my swatches are helpful for you! Your area of study sounds fascinating...please keep in touch and let me know when you publish. HI!!! I just recently found your blog and i have to say I am IN LOVE!! You're sooooo detailed and thorough when it comes to your reviews, which is so damn helpfull!! I can't stop reading your reviews!